Let me preface this by saying: I am usually so not a tour person. That said, I took an eco cycling tour in Bali and it was one of my favorite experiences of my whole 7 weeks backpacking in Southeast Asia. Despite my weariness of tours and all things organized, cycling in Bali was a wonderful experience, and I recommend everyone experience it for themselves! The tour company picked my group of 3 up from our hotel, Ubud Ganesha Inn, which at $15 per person for a three bed capacity room was a steal. 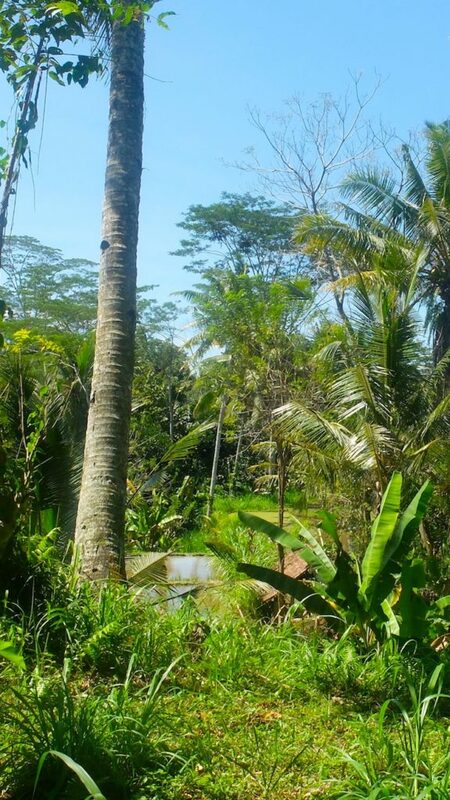 After loading up in the van at an ungodly early hour, we headed up north away from Ubud. After I jolted awake from my nap (I can sleep basically anywhere, so long as it’s moving), I was shocked by the beautiful scenery. Lush greenery and mountains everywhere: just a taste of what I’d continue to experience for the rest of the day. As we had a long day of cycling in Bali ahead of us, we started with a buffet breakfast at a hotel overlooking Mount Batur, one of the tallest volcanoes in Bali. Why yes, I do love it here! We went to a coffee plantation, where we tasted a few different coffees and were told of the “luwak” coffee — more famously known as “weasel poop coffee.” Basically, they make weasels eat coffee beans, collect their poop, and turn it into coffee. Yum? But, as someone who suffers from serious FOMO, I coughed up the 5 extra bucks to try the weasel poop coffee. I wish I could wax poetic about how disgusting or revelatory it was, but it was… just coffee. In all honesty, though, I don’t recommend you consume the luwak coffee – after doing my research, I find it really unethical in a way I had never considered prior to my tour. I guess I imagined them roaming free, eating coffee beans to their heart’s content (while someone picked up after them, I guess). But once I finished my coffee and toured the plantation, I felt rather guilty. The weasels simply are not kept in good conditions. Their enclosures, while large, had concrete floors and no real stimuli for the weasels to play with. It made me a bit depressed, and honestly, had I seen the cages beforehand I never would have paid for the coffee. 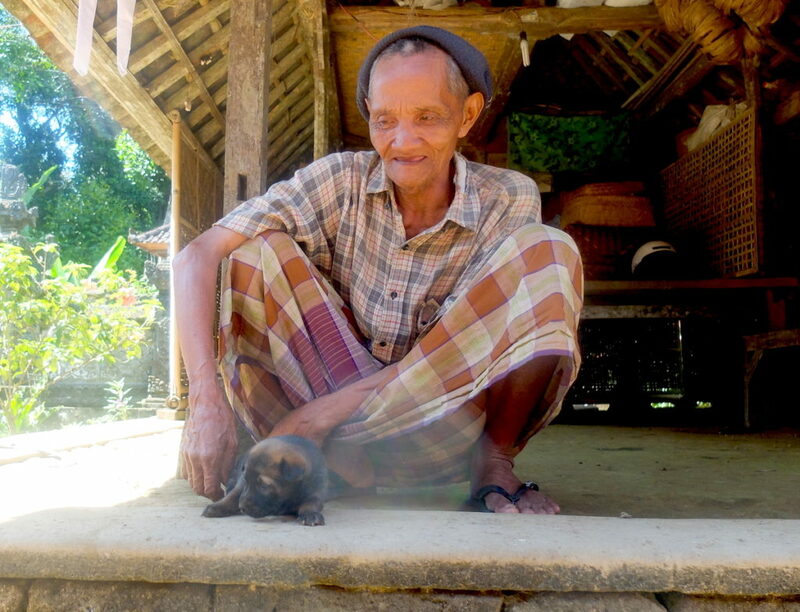 I recommend researching any tour that includes a coffee tour in Bali and opting out of the kopi luwak experience. After our weasel poop amuse-bouche, it was time for the cycling part of the cycling in Bali tour. After a quick primer on how to use the brakes (which would come much in handy, considering we biked in a single-file line downhill, with frequent stops), we were off! The tour was billed as a “downhill cycling tour” and that was pretty accurate. I don’t think I put my feet on the pedals once — until the end, when I and my friends opted for the optional uphill portion. 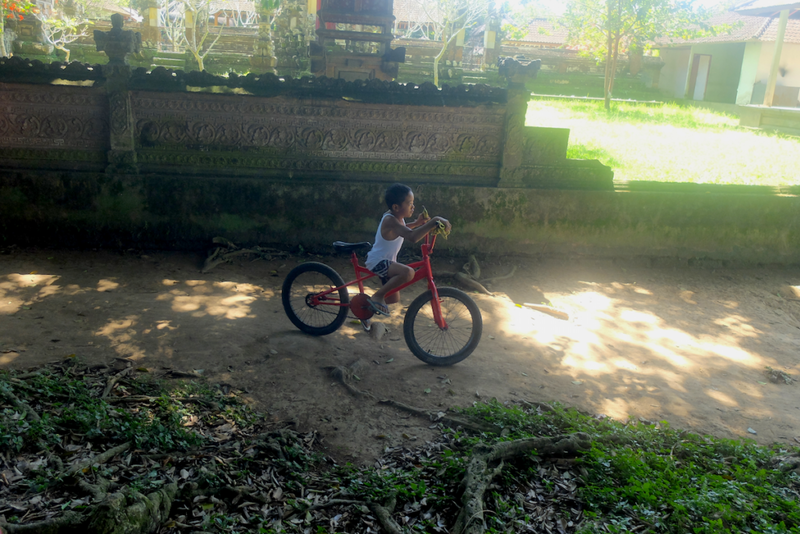 We biked through a beautiful remote village, where we got to explore a traditional Balinese compound. These compounds are fascinating! Rooted in Hindu and Buddhist thought, each compound houses several pavilions, a central courtyard, a family shrine, and several different stand-apart rooms such as bedrooms, kitchens, and food storage rooms. These compounds are intergenerational, with everyone from great-great-grandparents to the youngest babies living all in one property. Typically, a woman will move into the compound once she marries and becomes a part of this large extended family. I can’t stand the cuteness! We kept biking through the village, until we reached some stunning rice terraces. 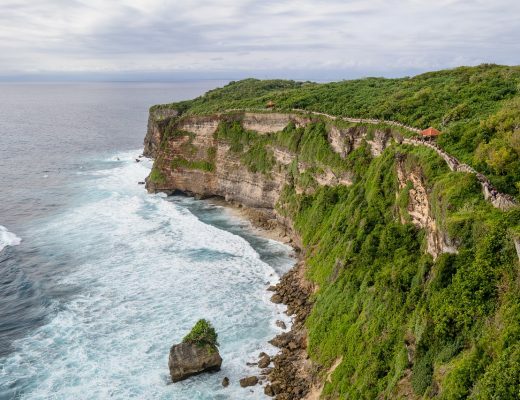 Now, if you do the cycling in Bali tour, these aren’t the terraces you’ve seen photos of on Pinterest: that’s Tegalalang, which this tour doesn’t cover. However, these terraces are completely tourist-free, so you can truly soak up the peace and quiet of the gorgeous Balinese countryside. If you want those iconic photos of Tegalalang to make your buddies back home drool, you’ll want to take a separate trip for that, either by renting a motorbike for the day or hiring a driver. If you rent a motorbike, don’t be stupid and please make sure to have an appropriate helmet. After reaching the rice terraces and taking some obligatory photos, the group splintered into two: those were tuckered out and wanted to go straight to the buffet, and those who wanted to kick their asses and opt for the uphill portion. Raring with energy, I and my travel buddies opted for the latter. About ten minutes into cycling in Bali heat in the peak of the day, I started to wonder if that was a bad idea. With a sheen of sweat coating me and cooling me, I finally got into a groove, counting in cycles of 4 over and over again to get me over the big hills. After about 45 minutes of an intense series of hills, I was never happier to collapse into a plate of food. This food, by the way, also happened to be some of the best food I’ve eaten IN MY LIFE. I know the word buffet brings to mind images of subpar, lukewarm food, but STAAAHP. This food was incredible, because Indonesian food is bangin’. 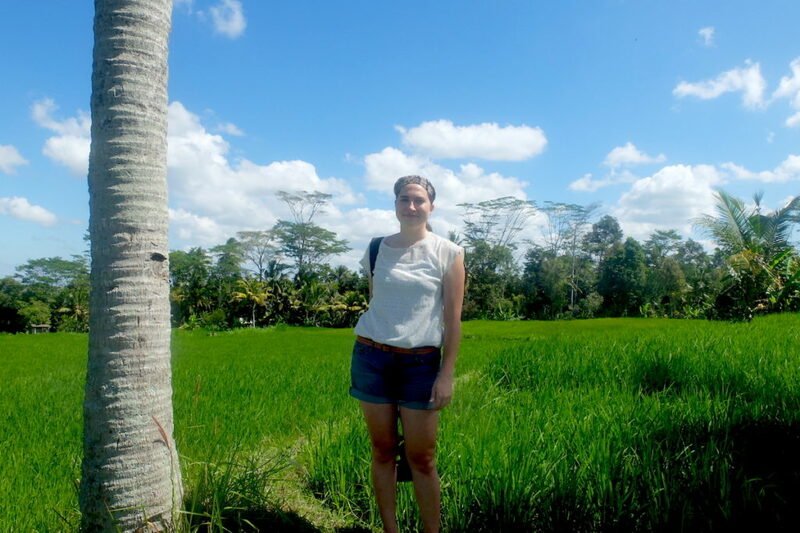 (BTW, if you want to take a Indonesian cooking class, Ubud is a great place to do so!) 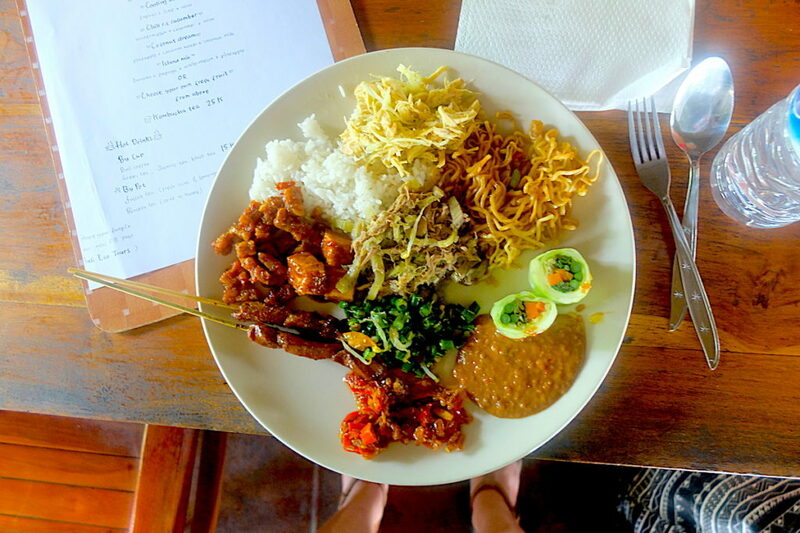 Mee goreng (fried noodles with veggies and shrimp crackers), homemade sambal (chili paste), gado gado (veggies with peanut sauce), opor ayam (coconut chicken), tempeh kecap (marinated tempeh cooked in a sweet soy and ketchup sauce)…. good god, I need to stop before I book a flight to Bali just to eat all the foods. Even better, everything at the buffet was all made in an organic garden in the back of the restaurant! One of the top 10 meals of my life. And that’s saying something. You may think this tour would have an insane price tag on it. After all, Bali does conjure up images of luxe honeymoons and outrageous villas, right? Well, there are truly two sides to Bali. 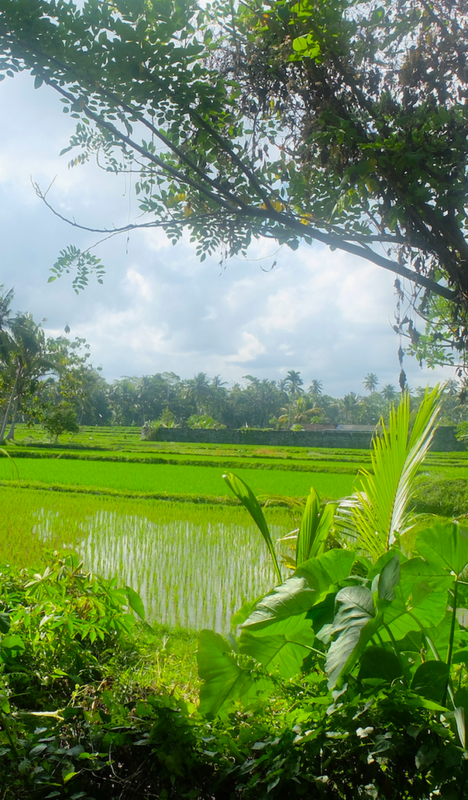 While the luxury side does most certainly exist, Bali is also a backpacker’s paradise and it’s quite simple to do Bali on a budget. 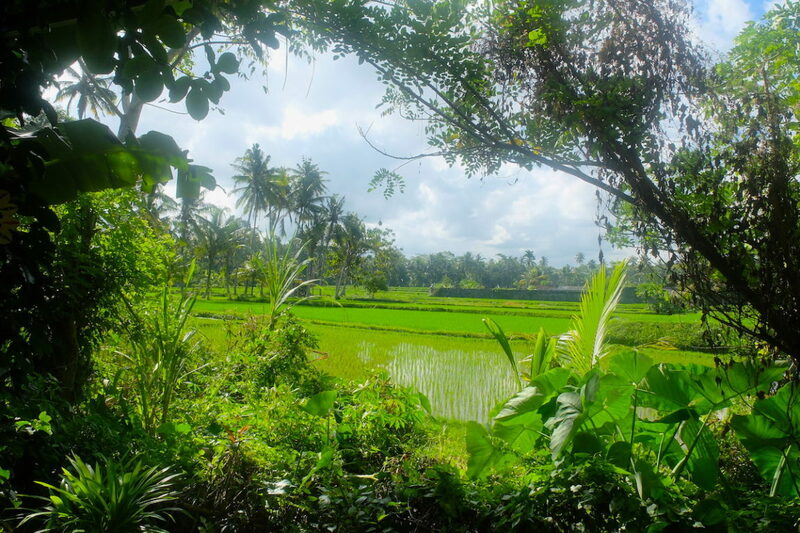 The cost for all of the eco cycling in Bali tour? $35 if you book in advance, $40 if not. For two buffets, round trip transfers, a coffee and tea tasting, and bike rental, I think it’s more than worth the $35. Note: I paid for this tour out of pocket. However, this post does contain affiliate links unrelated to the tour mentioned. That means that if you purchase something using one of these links, I will receive a small commission at no added cost to you. No BS – I only recommend accommodations, services, and products I truly believe in. Want to remember this post? Hover over the image to quickly Pin it! Interesting that the Philippines has it too! Y’know, I think it’s the same in Bali, and the “weasels” are actually civets. I think a word got lost in translation there. Such a blissful journey. Havent been to Bali in my life, but your happy story only inspires me to do so. And as far as cycling is concerned, I totally believe that cycling and slow travelling makes the most of wonderful journeys. LOL! “just coffee” well….I guess that really is preferable to somehow being able to taste that the coffee has been through the digestive track of a weasel….at least it is to me!! LOL! Bali, looks so very, impossibly gorgeous! I can’t wait to visit and bring the kids. Bali is a fantastic place for kids! They would absolutely love it. 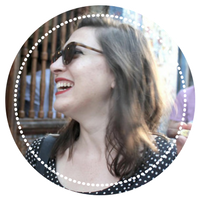 Beautiful post and love it when bloggers are honest about their experiences as you were about the poop-coffee. Although it has become somewhat of a viral movement where poop-coffee is being “discovered” all over the world from one animal or another. 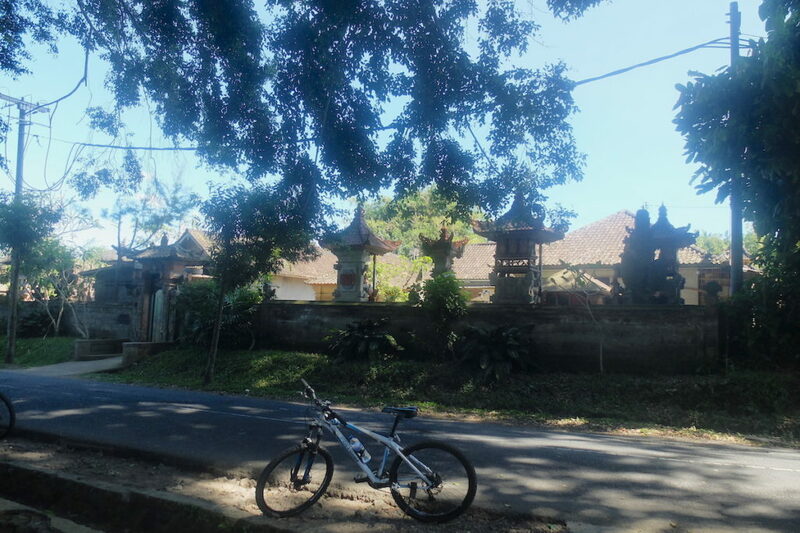 Nevertheless, Bali is a beautiful place and I am glad you went along cycling there to discover it’s real self outside of the famous more touristy towns. Thank you very much. I hate to admit that I may have contributed to poor animal welfare in any way, but I think it’s important for everyone to know. That said, I don’t know how other places make the coffee – another commented said that it’s popular in the Philippines as well but the animals are uncaged, which I would feel more comfortable supporting. 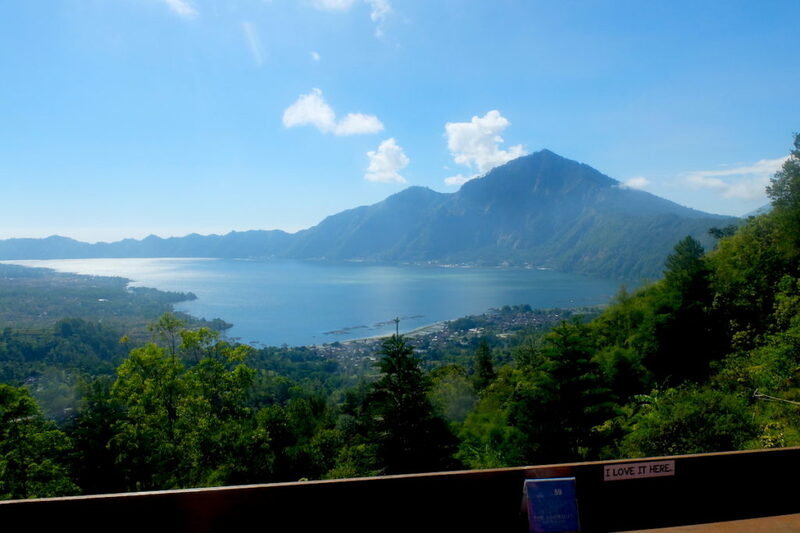 And yes, the further you get out of the touristy towns of Bali, the more lovely it gets. I also spent some time in Amed which I loved. Thanks for this informative post. I always wanted to visit Bali and now with this details I can say I know what and what not to do, but we all know experience is the best teacher so, I’ll try out the luwak coffee to tell from experience as I like to try things out! Also good to know that Uber is rendering services which makes it easier. You’re welcome! So glad that you enjoyed. I do hope you get a chance to visit Bali and do the tour, it was such a great experience! Totally agree on cycling! Yeah, I wish I had known more about the coffee before I tried it. We did the tasting first followed by the tour of the coffee plantation, which was a bit of a letdown. Looks like a great tour. I am also not one for group tours but some of the ones I have been on, I can not recommend enough! Sometimes they take you to places you just can see by yourself (or find). Great same about the weasel pop coffee though. I don’t like the sounds of the animal treatments. Perhaps they don’t show you the cages until after to bought it for that reason. What a fun experience! 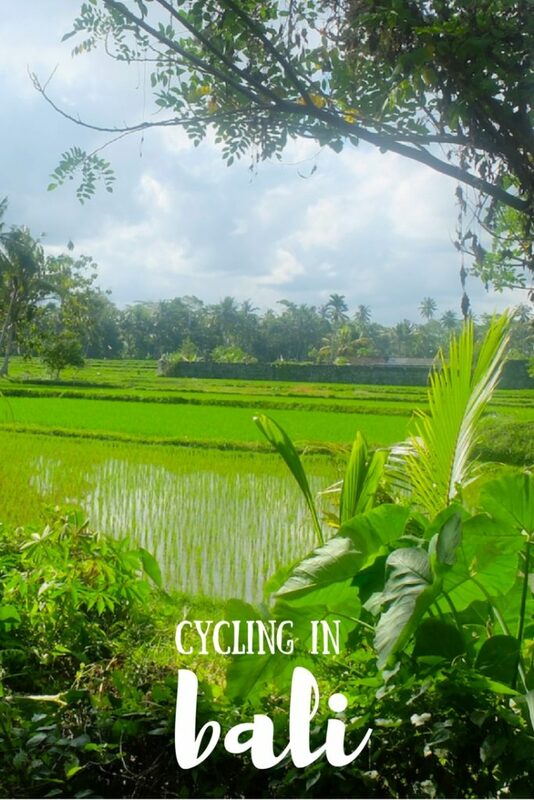 If we do get to visit Bali again, a cycling expedition would be on our list! I hope you get to visit Bali again too! A beautiful place! Time to plan a getaway 😀 But in all seriousness, I do love winter in Sweden. I suppose now it’s the darkest time of the year, but when I went in February last year, it was really lovely. Stay warm! Beautiful places Indonesia - things you cannot miss!